Most of the questions I have dealt with so far have been on topics in math, but I will sometimes get a question in physics. I have to deal with these questions more carefully because of the rustiness of my brain. Luckily, almost all the questions I have gotten so far in this context have been related to Classical Newtonian Mechanics, a topic that seems somewhat intuitive to me. Most often I can work things out from first principles. I was presented with the following problem yesterday. There is heavy block of wood of a certain mass sitting on a frictionless table . 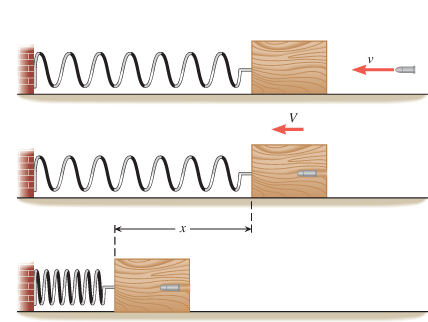 The block of wood is attached to a spring on one side that is fixed to a wall. You are given the constant that will describe the behavior of the spring. A bullet of a certain mass is fired into the block of wood from the opposite side of the spring, and it hits the block with a certain velocity. The question was about the maximum displacement of the block of wood under these conditions. The figure below represents the physical setup. Anyway, I spent so much time thinking about this topic yesterday that it seems to have gotten into my head. It was towards early morning, when I was deep in my dreams, dreams which can often be entangled and confusing and easy to forget, that the problem confronted me in a different way. In these dreams I found myself in some unknown place with railroad tracks that happened to be not too far away. I saw the signals for the railroad tracks out of the corner of my eye, and one of the two signals had turned green. Before too long, a massive railroad locomotive was thundering past projecting power. The next instant in my dream I noticed that in addition to the freight cars that the locomotive was pulling, there was this solitary freight car in front of it. But, goodness me, the freight car was not attached to the locomotive!! It was being pushed in front of it in a free manner. This cannot be safe, I remember thinking to myself! The next thing that happened in my dream was that the freight car had derailed and crashed. I do not remember if I woke up soon after. I think my dream was related to both my tutoring experience the previous day and the fact that the weekend before we had walked on the C&O canal towpath beside some active railroad tracks near Point of Rocks. The neurons in my brain were doing a dance of some sort connecting different independent strands of thought even as I slept. Coming back to Newton, how many of you know that he was one of the inventors of calculus. This guy was simply amazing when it comes to the range of topics he covered. I have also mentioned his work on Gravity in an earlier blog. In one way or other, newton in related to every branch of mathematics. Almost everyone knows newton was one of the inventors of calculus.. But how many of us know Newton is the inventor of Binomial theorem? Yeah, he was the one who generalized the binominal theorem for non-integers. I find it fascinating that this leads us directly to the concept of infinite series.